You have probably encountered some whitish substance on your battery terminal when you are opening your hood. The car’s battery is vital for the smooth operation of the automobile. It controls tasks like ignition, headlights, listening to the radio, or operating the AC. Having a car stall in the middle of the road can be embarrassing for many, and if you do not have jumper cables, you may find yourself stranded in the middle of nowhere. Battery terminal corrosion will appear after years of driving with the same battery, and you need to understand what causes it and how to fix it. The battery turns acid into electric current. There moments the hydrogen gas in the battery leaks and finds its way to the atmosphere. It reacts with other substances, and you have battery terminal corrosion. Depending on which side it forms, you can diagnose various battery problems – if it is on the negative terminal, this is a sign of undercharging while if it is on the positive terminal, it is due to overcharging. Most batteries suffer from undercharging, and this is the reason you see it more on the negative side. This problem is synonymous with lead-acid batteries. Due to age or damage, the electrolyte in the battery can leak and accumulate on the battery terminals. The probability of the electrolyte leaking is increased if you overfill the battery water. Copper is a good conductor and does not corrode easily. However, when electric currents pass through the copper terminals, there is the production of copper sulfate, which leads to battery terminal corrosion. A bluish precipitate on the copper terminals can identify copper sulfate. Copper sulfate does not conduct electricity well, and that is why you will start experiencing trouble starting your car. If you overfill your battery with water, it can cause the electrolyte to leak through the vents and corrode the terminals. Ensure that you put the right amount of battery water. 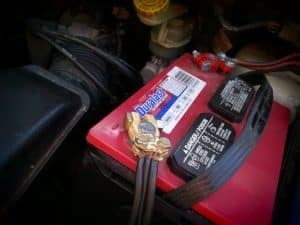 If you overcharge your battery something similar happens – the electrolyte gets charged upon kinetic energy and overflow to the terminals causing corrosion. If you want to remove copper sulfate that has accumulated on the terminals, you will need some baking soda water solution and a brush. First, ensure that the car’s ignition has been turned off. Remove the battery terminals and use your brush to remove some of the corrosion. Pour the baking soda solution and continue removing the corrosion with your brush. Once done clean the terminals with some clean water. It is prudent that you smear some wheel bearing grease on the terminals to prevent further damage. Some people may opt for petroleum jelly, but this does not last as long as grease. Most of the soft drinks that we take have some carbonic acid in them. Pour some of the soda on the terminals and use a soft sponge to remove the residue. This works well in the absence of a baking soda-water solution. If your battery has excessive corrosion on the terminals, you will need to use baking soda-water solution and an old toothbrush. Start by removing the battery terminals – the negative should be first. Mix your baking soda solution and place it in cups. Soak each of the terminals in the solution and let it soak for the next 20 minutes. Scrub off the corrosive materials on the terminals. Pour the soda solution and make a fresh one. Soak the battery terminals again while removing the corrosive materials. Clean the terminals with water and let it dry or wipe with a damp cloth. You can also use sandpaper to clean the terminals. Apply some grease or Vaseline and reattach the terminals – start with positive. There is that moment when your battery has outlived its purpose, but you need just one more charge to keep you going. If you have some aspirin tablets, you can pop two into the battery, and you will get one more charge. Aspirin has acetylsalicylic acid which when combined with the battery’s sulfuric acid gives you a charge. These clamps are one of the best in the market and will help prevent further battery terminal corrosion. The clamps are made from tinned copper and ensure that the whole clamp gets into contact with electric current. One of the causes of battery terminal corrosion is a battery that is overcharged or undercharged. The manufacturers manual often has the recommended battery voltage. You should adhere to this if you want to prevent corrosion forming on the terminals. There are various sprays that are available in the market to prevent terminal corrosion. You can also use Vaseline or grease if you find the sprays expensive. Coated felt pads could also be used to prevent corrosion of the battery terminals. The battery is a vital component of a car. It sends electricity to the starter which in turn sends electrical signals to the spark plugs and your car starts. When your battery is low on power, you will experience problems starting it. Causes of low battery vary – it could be that your battery is old or the terminals have excessive corrosion. The lead-acid battery uses a sulfuric acid mixture to generate power. Hydrogen molecules leak into the atmosphere and when mixed with other compounds form corrosion on the terminals. If you are far from home, you can use soda to remove the corrosion. Soda has carbonic acid which reacts with the corrosive substance. If you are home use a baking soda – water solution. Pour the contents on the corroded battery terminals while removing the substance with a soft brush. Wash off the area with clean water. You can also smear some grease or Vaseline on the terminals to prevent further corrosion. 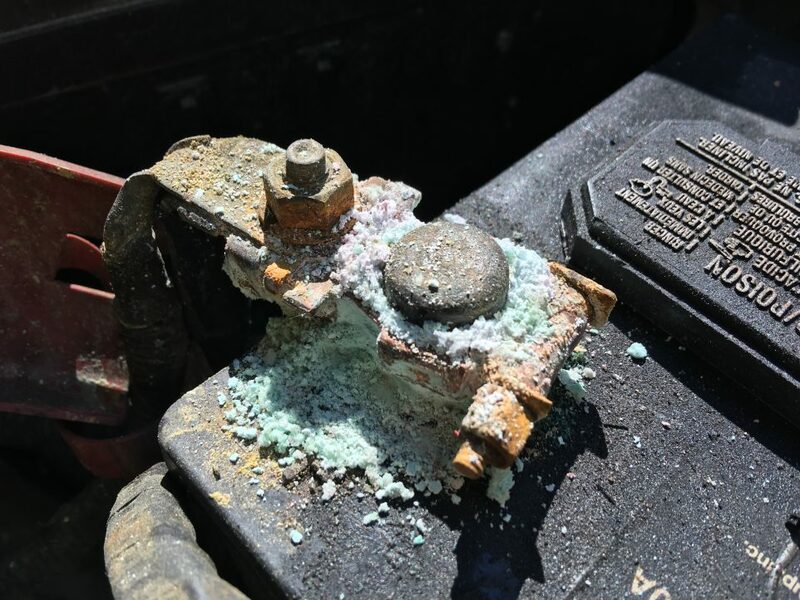 It is wise to always check the voltage of your battery – undercharging and overcharging can cause battery terminal corrosion. What Size of Jumper Cables Should I Carry?